The New Century Chamber Orchestra delivered its latest concert series in halls around the Bay Area last weekend, culminating at the Osher Marin Jewish Community Center on Sunday, Nov. 12. Since 2008 they have been led by Nadja Salerno-Sonnenberg, a divine violinist who is also a forceful personality, and although they had impressive achievements under her leadership, their own cohesion was increasingly subsumed in her wake. Sunday’s concert showed how they have begun to rediscover the camaraderie of their roots. Originally conceived in 1992 by violinist Stuart Canin as a conductor-less group of strings, all gaining cues from each other and listening intently as they played, their long alliance with stardom let some of that unravel. 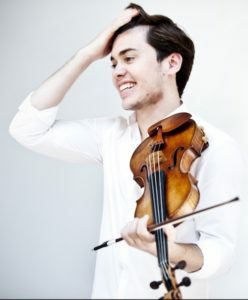 Young violinist Benjamin Beilman was the guest first violinist this past weekend, and although he is already beginning a stellar ascent, it is a quieter and inclusive sort of apotheosis, and has already inspired a return to their form. Benjamin Beilman led the NCCO in four concerts around the Bay Area. This program was exhilarating but traditional, beginning with the early experimental techniques of Baroque composer von Biber, and also including the much loved Violin Concerto in E major by Bach and an arrangement of Beethoven’s “Serioso” string quartet. Each of these works had its own kind of razzle-dazzle. Biber was jaw-dropping in the modern dissonance of his “non-fugue fugue”. The Bach gave Beilman an opportunity to show off the incredible fluidity of a 27-year-old prodigy on a deep-toned 1709 Stradivarius. And the Beethoven was an opportunity to hear the precision and passion of the entire group, nineteen musicians playing what was originally written for four. Along with giving it the depth of an orchestra, they delivered passages that were impossibly nimble. This was exhilarating to hear, and the members of New Century literally glowed afterwards. There were two other works on the program, each with its own kind of magic. After escaping revolution and World War, Igor Stravinsky had been living in Hollywood for some years before writing his Concerto in D in 1946. His musical tastes had rotated from the rhythmic vigor of his early Ukraine folk-inspired roots into the neoclassical musings of his middle period. But this Concerto partook of both worlds, and even laid out the groundwork for his later serialism. The New Century gave this an edge-of-seat immediacy with sharp rhythms and brutal tremolos, and then gave way to limpid harmonies and the gentle weighting of dance in the “Arioso: Andantino” movement. But in the Rondo they returned to fierce attacks and a hornet’s nest of tremolos. The other unusual work was Andrew Norman’s Gran Turismo, written for “eight virtuoso violins,” according to its title. Like the racing car video game of the same name, this was a work of high spirits and grinding rhythms, and the eight violinists tossed the themes back and forth against a backdrop of minimalist sixteenths and long slides. This did not feel mechanical, but more like an ode to the beauty of a muscle car – the gunned engine sounds, the grinding of down shifts, and the slick timeless feeling of tires sliding out of control. Written in 2007, this was a young composer finding flamboyant material in the folk idioms of our own day, and a surprising match for Stravinsky’s Russian folk rhythms. With a fierce ending that was notated “floor it!” any ensemble would need to be at the top of its form – and brave – to pull this off. These violinists, egged to their max by Beilman, tore across the finish line. Their next concert is with violinist Daniel Hope as Artistic Partner, and includes two renowned pianists, Menahem Pressler and Sebastian Knauer performing an all-Mozart program to celebrate the composer’s birthday (actually on Jan. 27). These performances will be at the First Congregational Church in Berkeley on Jan. 25 and in Palo Alto, San Francisco, and Marin on Jan. 26 – 28. See ncco.org for tickets and information. Photo above of violinist Benjamin Beilman, courtesy of the artist.